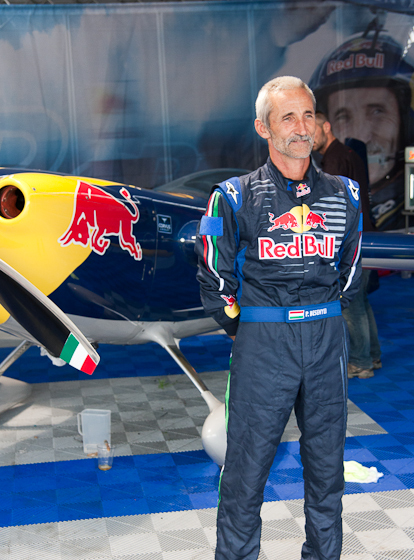 I managed to catch Matthias Dolderer, Kirby Chambliss, Mike Goulian and Peter Besenyei at the race airport and they were kind enough to provide an interview for windsoriteDOTca after the Qualifying rounds. 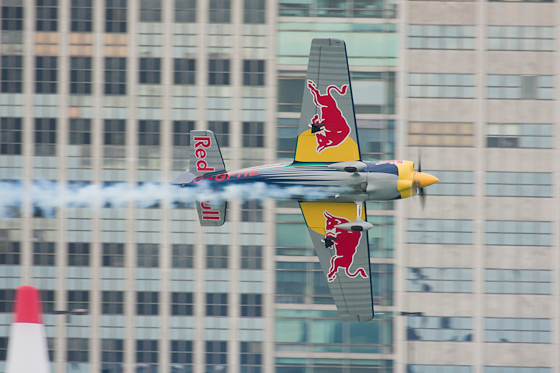 Dolderer finished 5th on Sunday, Chambliss pulled of a third place podium finish, Goulian managed to finish in 6th place and Peter Besenyei, sometimes referred to as the “godfather of the Red Bull Air Race” for his help developing it in 2001, finished in 10th place on Sunday. Do you plan on making any changes for tomorrow? Nothing in your strategy or your planning? Maybe a little shorter lines. 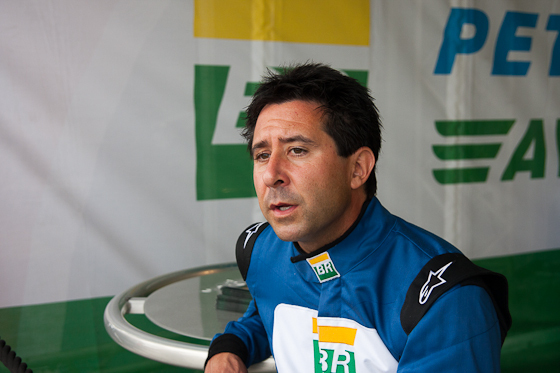 The main goal is to get a good time in qualifying. And we have it. How is this course different from others around the world? There are two parts in this race which are technically very challenging. The chincane and the exit from gate 13 to chicane is tricky. What makes it tricky is the wind change at the end especially from the Detroit side when the rough wind is coming from the north. Do you have any strategy that you think gives you an edge over the other competitors? I don’t know about the other pilot’s strategies. My own is to concentrate on my stats. I’m getting more and more into the tricks. At the beginning of this year I had some difficulty to apply really clean lines but that’s solved. I think that I’m pretty much prepared for the rest of the season and I’m looking forward to getting a better time tomorrow. 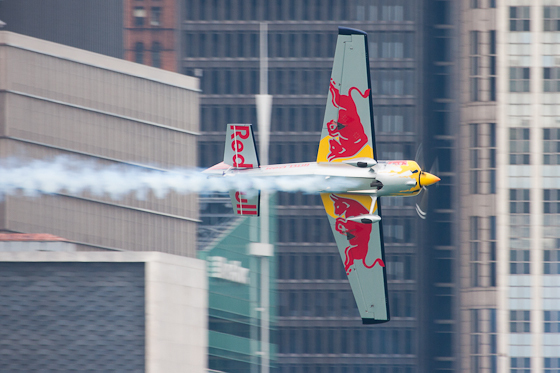 We conducted an informal interview with Kirby Chambliss and found out that the track was very difficult for him and other pilots due to the strong wind coming off of the Detroit side of the river. 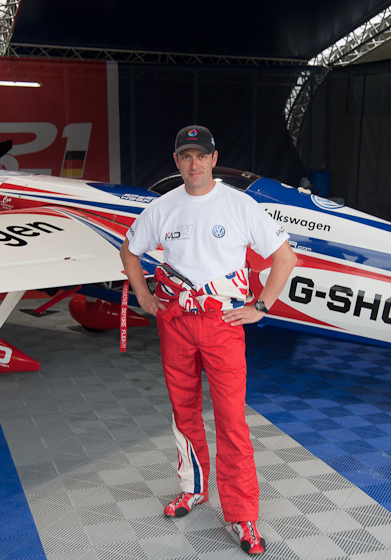 Chambliss, who was flying the Edge 540, stated that the preparation for his career as a Red Bull Air Racer was mostly through performing in airshows. 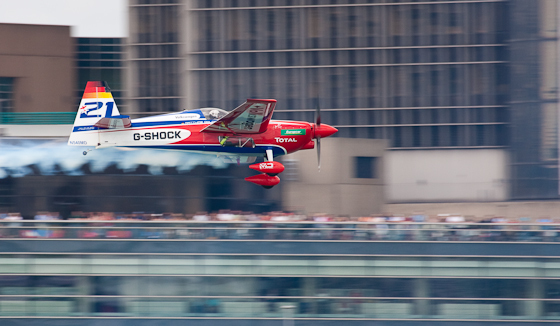 When asked if he thinks about the water just feet below him while he is going at over 300km/h Kirby Chambliss said that he does not even think about the water. He is so comfortable flying that he does not even realize it’s there, only focusing on the pylons, flying is almost second nature to him (similar to driving a car). So what do you do to prepare immediately before or say the morning of? I have noticed you have your course layout over here. Yeah. Some people do it, some people don’t. I usually put it in the back. Get a lot of sleep. Watch when you eat. You should try to eat at 10 o’clock, and then again at 12:30 because you have to fly at 2, so your blood sugar doesn’t spike. Throw a banana or a couple of apples, drink a bunch of water with electrolytes in it. All I try to do is joke around, be comfortable, be light and try not to get myself to crazy about it. Last night I got to bed at 9:30 and fell asleep around 1 am. You try to relax. You have to get into the zone. My first run happened in slow motion. You just need to try to and recreate that. It’s about being comfortable. I have two words in my brain: “(be) nimble”, “(be) quick”. Be in the moment make sure you are ready. When I take off I will be practicing (in my head) on the way out there. When it’s time to move the plane, move the plane but try to minimize all the movements between gates. Try to make as little physical movements as you can. Do you plan on making any changes for tomorrow in your plane or your strategy? We are going to change the RPMs at the exit because we didn’t have enough. Sometimes the airplane feels like it’s shaking. In reality what’s happens is that you scrubbed off the speed somewhere else which made that whence. Do you find that in different when you race in the warmer climates? Do you have to make major adjustments? You can’t pull on the plane. The hotter it gets the less G you get. In Monument Valley (2007) it was so hot that the airplane didn’t want to work and it overheated the engine. Did you like the course? I like it so much. It provides tight turns. It’s very technical and tight (the course). Are you using the Edge 540 or something different? How well did you do in the qualifying today? 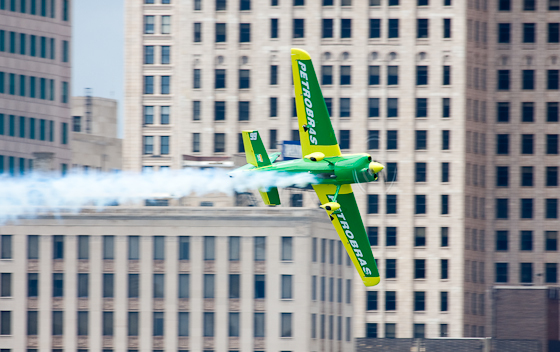 Do you plan on making any changes in your plane or your strategy for tomorrow morning? No, I had a safe flight. How did Matt Hall’s blunder today affect your mental state? It’s a warning that what we are doing (something) that can be dangerous. Thanks the pilots who participated in these interviews and were able to share their experinces with our readers. Good luck in New York! I would also like to thank Sanja Frkovic, an upcoming photographer, for transcripting the interview, it is much appreciated.